I think I am slowly getting more organized. For example, I just planned for a whole week's menu. Alright, no big deal. But if you know me, you know how haphazard I am, so this is definitely a good start. After planning what's for dinner this week, I feel a sense of purpose when dinner time approaches. 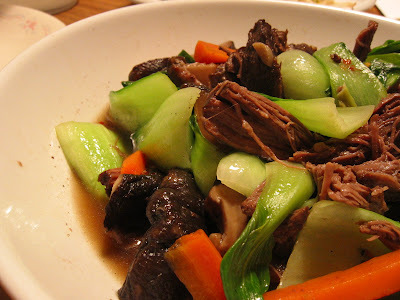 Tonight we have Chinese Stove Top Pot Roast. Had I not planned for this recipe earlier, I wouldn't be able to serve dinner on time! Because the pot roast took a good 3 hours to cook! Normally I would choose something that can be cooked within a short time, but this recipe has been lying in my to-try-list for awhile; Moreover, it is also one of the staff favorites for October issue of Cookinglight, so I decided to give it a try. 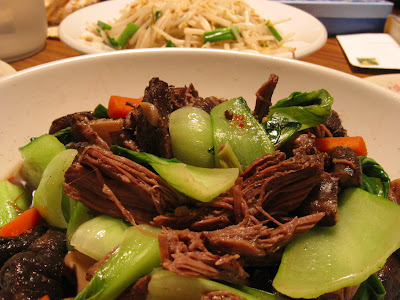 Ginger, soy sauce, star anise, and Chinese five-spice powder infuse this dish with Asian flavor. If you can't find fresh Chinese egg noodles, substitute rice noodles or even linguine. Heat 2 teaspoons oil in a large Dutch oven over medium-high heat. Sprinkle roast evenly with five-spice powder and salt. Add meat to pan; cook 5 minutes, turning to brown on all sides. Add broth and next 6 ingredients (through star anise) to pan; bring to a simmer. Cover, reduced heat, and simmer 3 1/2 hours or until meat is tender. Remove meat from pan. Cover and keep warm. Strain cooking liquid through a sieve over a bowl; discard solids. Heat the remaining 2 teaspoons oil in pan over medium-high heat. Add mushrooms and carrot to pan; sauté 5 minutes. Add bok choy and 4 cups reserved cooking liquid to pan. Cover and cook 5 minutes or until bok choy is tender. Cook noodles according to package directions, omitting salt and fat. Drain. Divide noodles evenly among 8 bowls. Shred the meat with 2 forks; arrange 3 ounces meat over each serving. Top each serving with 2 tablespoons vegetable mixture and 1/2 cup broth. Place 1 bok choy half on each serving; sprinkle each serving with 1 1/2 teaspoons green onions.